Tap tap. Is this thing on? Time to blow the cobwebs off the VCM blog. The lack of posts suggest that everyone has been too busy making the most of the first Scottish summer for about five years. More riding, less writing. You can’t waste opportunities like these. 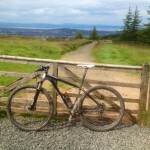 Dusty trails needed to be shredded before everything reverts to standard Scottish dreich (like today). I can’t speak for the other few dozen VCM reprobates, but one of the highlights of my summer was a cracking two days riding a Cairngorm loop with Simon Fairfull in late May. We dismissed THE Cairngorm Loop as we only had two days, and whilst the full 300k route is of course more than do-able in that time, we elected to do a slightly shorter version so that we could enjoy it, rather than making it feel too much like a race. After some scouring of maps and consultation with Scottish bikepacking oracle Russell Stout, we settled on the lesser known “Tour of the Cairngorms” route:- most of the outer loop of the Cairngorm Loop, but eschewing the Aviemore section in favour of Loch Morlich and Glenmore, and then finishing down Glen Tilt rather than climbing up to Fealar Lodge and the south east side of Beinn a’Ghlo. Basking in late May sunshine we set off as pasty faced Scots on a Sunday morning (I elected to ride some of the first day in a running vest to keep cool, but the less said about that the better). The first few hours out of Blair Atholl were ticked off at a worryingly easy pace. Without trying, we were averaging over 12mph for several hours. This didn’t feel like the bikepacking I’m used to. 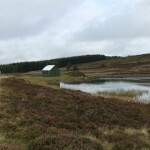 Gaick Lodge was dispatched and onwards down to Feshiebridge and a brief return to civilisation at Loch Insh. 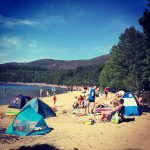 After seeing barely anyone for the first few hours, we knew that the section through Rothiemurchus and Loch Morlich would be the busiest of the route, but nothing could prepare us the bank holiday Sunday on Costa del Loch Morlich that faced us. Thousands of lounging Scots completely covered the beach and the main Cairngorm road was a double-parked strip of tarmac carnage. We stopped for a drink and ice-cream to soak up the hilarity of it all for 15 minutes before getting the hell out of there as quickly as our laden bikes could carry us. As expected, 20 minutes later and after passing the Ryvoan Bothy, Highland normality was restored and all was blissfully quiet again, save for the crunch of tyre on gravel, dust and pine needles. The next few hours saw a gradual slowing of pace as weary legs began to take their toll and the route became just a little rougher. 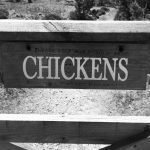 A comment on our riding? 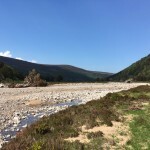 We had set our sights on Tomintoul for dinner and a camp spot somewhere along the river just out of town, so we rolled into the town square eager to fill hungry stomachs. Perhaps it was the sight (and smell) of two tired cyclists that caused the reception (or lack of), but something felt decidedly odd about the town. In a town square filled with restaurants and hotels we eventually honed in on the one with outside tables and the most buzz about it. That was our first mistake. Apparently we would have to wait over an hour for food (on a Sunday evening in May?!) so shuffled across the road to the next pub. Despite a close call where our requested ‘orange and lemonade’ was almost served as a bowl of sliced oranges and lemons, we were filled with generic greasy food which at least replenished some burnt calories. Limiting our losses we set out for a third hostelry for our post-dinner pint, and nipped into what looked like the smartest / newest hotel in town. Despite the white tablecloth attempt at an upmarket look, the barman was at pains to stress that grubby bikers would still be welcome, and so our cold pint was enjoyed over a discussion with a barman who turned out to be a mountain biker (and a pretty fast sounding enduro rider). Result. Oddly, the only other family in the bar elected to leave soon after we arrived. My damp shoes from that river crossing must have been smelling pretty bad by that point. We had planned to ride a few miles out of town and pitch near the river somewhere, but our helpful barman pointed out that the Highland Games field would be empty, flat, closer, and suffer less from the evening midges which were undoubtedly congregating by the river keen for an evening feast. In a win-win for everyone we ordered a few more pints since we wouldn’t have to pedal far to our new not-so-wildcamping spot. 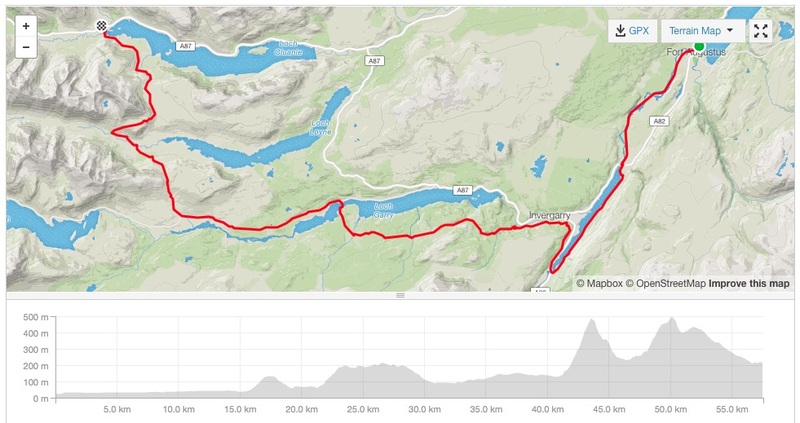 Day two was due to provide a shorter ride (85km vs 120km on day one, and only 1,000m of climbing vs 1,700m). The first few miles south down the River Avon road and track were easily dispatched, although in a slightly annoying fashion as every punchy climb was followed in short order by a descent back to the river. 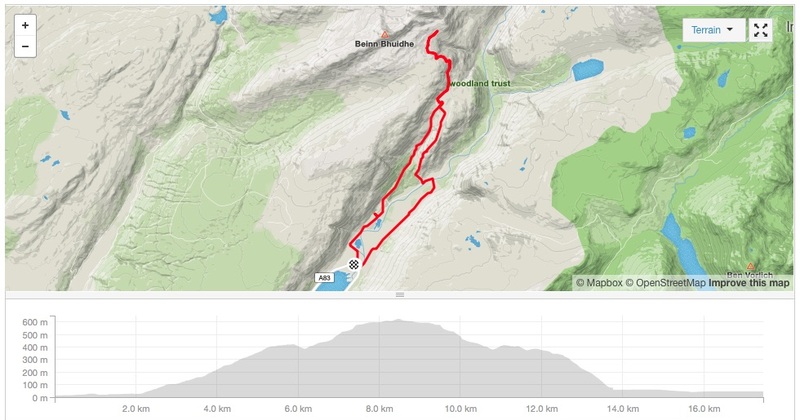 “Somebody” had glanced at the map on his Garmin screen and naively assumed that the high point of the morning’s climb over to Braemar was at Loch Builg. It therefore came as something of a surprise to have to climb a further few hundred metres over the shoulder of the adjacent Corbett. Oops. All good character (and appetite) building. 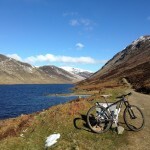 A fast descent to Braemar and welcome coffee and brunch followed in the always excellent “The Bothy”. One of the benefits of this chosen route is that we knew the following section would be relatively flat and easy, and so it proved. The ride past Mar Lodge was uneventful on the way to the Geldie ‘Fords’. A bone dry May allowed the river to be pedalled over without difficulty and onwards to the top of Glen Tilt. A momentary SPD-fail style topple saw Simon turning his leg into a quite impressive balloon which wasn’t ideal, but thankfully the mystical properties of some recovery Haribo allowed us to continue southwards, with the promise of a dip in the river still to come. Having ridden this section before a couple of times, I knew it would be an easy blast to the finish after tight singletrack at the top of the glen. Pedalling back into the promised land of well-earned sugary drinks and ice-creams in Blair Atholl we passed a couple of fresh looking riders heading up towards the loop. Knowing nods were exchanged. This was Scottish summer bikepacking at its best – memories of great riding that will last even longer than those sunburn marks. A ride of two halves. 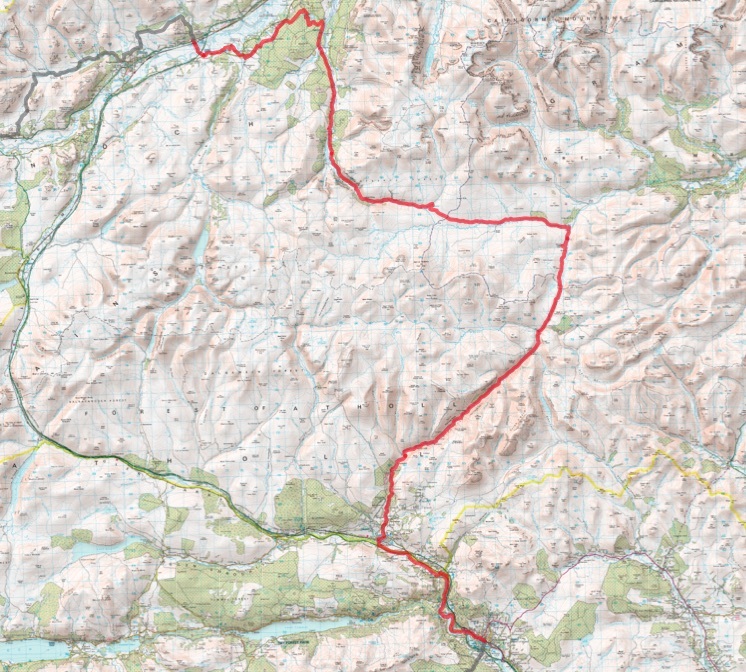 A couple of days after the last section (long enough for a few days recovery), I used our Fort Augustus holiday cottage as the handy base for the next section of the Scottish National Trail. 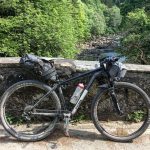 Although I had initially planned on separate sections between Fort Augustus and Cluanie, and then Cluanie to Morvich, I wondered about combining the two, since I am not in this corner of the world often, and it would be good to tick off a few miles. The weather for our holiday week was dry but breezy and not particularly warm. Still, you can’t be too greedy in April, so this would do, and so I headed out early, leaving the understanding Mrs W to entertain the boys. 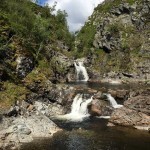 The first section from Fort Augustus was predictably easy – westwards along the canalside path following the Great Glen Way and then along the old railway line on the south side of Loch Oich, before heading round the head of the loch and into the forest above Invergarry. Good forestry roads allowed some quick miles to be ticked off down to the farm at Greenfield and then across the narrows of Loch Garry and on to the public road – apparently the longest dead end public road in the country. As expected, the turning off the road a mile or so west of Kingie marked an abrupt end to the fast miles. The footpath up and over the shoulder of Mam na Seilg was obvious and fairly well made, but damp in places and generally just too steep or rough to ride for any great length. Ride a few hundred metres, walk a few hundred metres, repeat. The descent was little faster – interspersed with boulders and rocky slabs it was reasonable rideable, but I had my head dialled to full on mincing mode, and opted to walk more than I should have. I had not passed anybody for miles, and this was not the time for a silly spill. 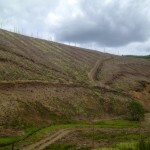 The lower section gradually flattened to a heathery and grassy valley bottom – more rideable but little faster. No sooner had I waded across the River Loyne (mercifully low after a few dry weeks) and squelched along the bank on the other side, than the path headed sharply upwards again – rocky climbing (again generally too steep or loose to ride) over Creag Liathais. The summit plateau was relatively flat and allowed for better riding on a good, obvious path, before a short, enjoyable descent down to the what is left of the road to Loch Loyne – the old “Road to the Isles.” Apparently in dry months, turning east down the road allows the old bridges to be visible in the loch which was formed when the glen was dammed for a hydro scheme, but today I was turning north west for the short fast run down to the A87 at Cluanie – slowed only by a stinking westerly headwind, and a huge herd of deer brazenly blocking the road. I rolled up to the inn at Cluanie way behind schedule. Having already read the route guide for the next section to Morvich, I suspected that the riding would be no quicker, and given that on current pace I was likely to be an hour late for my scheduled wife-driven taxi ride home, I elected to put my feet up with a coffee at the Inn. Curiosity got the better of me as I waited for my lift home though, and I rode up the first mile of the next section on An Caorann Mor towards the Alltbeithe Hostel. A stiff climb on a good wide path suggested easy riding, but the route guide and the narrowing alongside a burn on the OS map suggests otherwise, and that boggy fun will be saved for another day. Another short section ticked off – good views, barely a soul in sight all day and still an enjoyable day out in the hills. 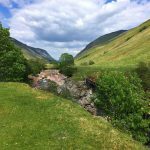 This entry was posted in Scottish National Trail on June 17, 2017 by admin. After the easy logistics of the last section of the National Trail, the section to Fort Augustus looked a bit trickier, with the finish being a long drive from the start, and miles from a train station. A holiday cottage for the week in Fort Augustus solved that issue though, and I was duly turfed out of the car in Kingussie, to leave my wife and children to finish the drive up on their own. The first few miles out of Kingussie were on what looked like a relatively new and well signposted walking trail, climbing through the woods towards Loch Gynack. Unfortunately the awkwardly placed stone steps meant that whilst this would make an interesting descent, it was an impossible climb in places, unless your surname is MacAskill. At least when Loch Gynack came into view, the singletrack improved to that well drained, pine needle covered stuff which is so common in the Cairngorms. On approaching Newtonmore, a “wildcat” trail offered the possibility of singletrack through managed woods, but unfortunately this did mean more gates per metre than even the worst sections of the West Highland Way. Ride, dismount, unchain, open, close, re-chain, remount, repeat. No wildcats spotted either. Harrumph. Emerging on to the Newtonmore to Glen Banchor road allowed a few miles to be ticked off on tarmac and then good double track. Unfortunately the pace slowed again as the path petered out through Glen Banchor, and time was wasted dithering at river crossings. After ditching the socks and shoes for the first major crossing, getting damp feet on the subsequent bogs meant I adopted a rather more relaxed attitude to subsequent splashes. At least in double figure April temperatures your feet soon dry off. Keen to make up some time when emerging to the good track at Strath an Eilich, I overshot my planned off-piste turnoff when doing 20mph down hill, but was in no mood to back track for the sake of another boggy “footpath”. Continuing down through the grounds of Cluny Castle just meant that I emerged on to the A86 a mile earlier than expected. 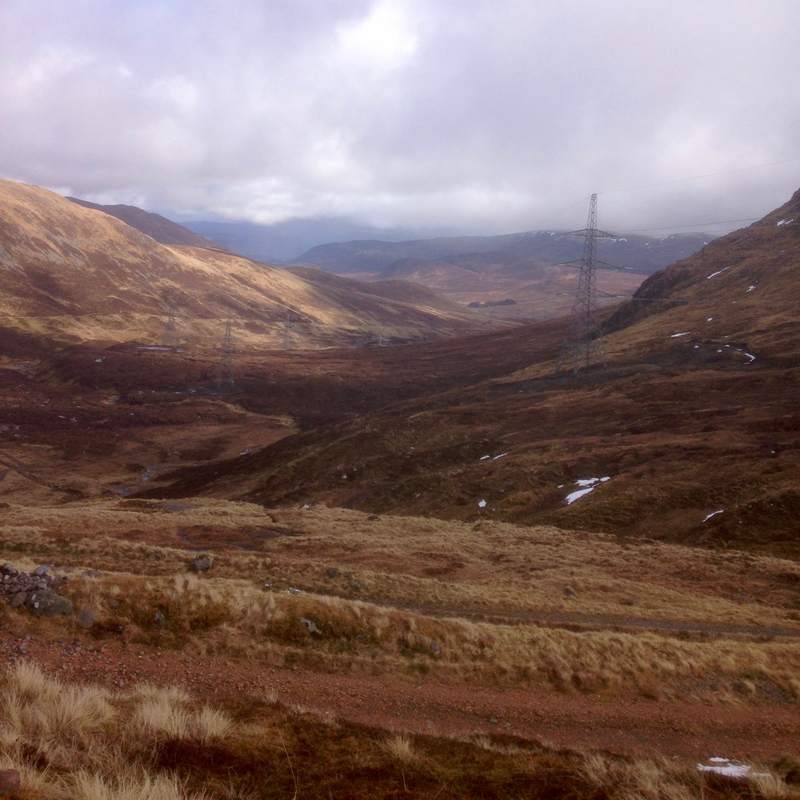 The ride through Laggan towards to the Melgarve Bothy was as expected – easy riding, but a bit sloggy into a stiff April headwind. Despite the knobbly winter tyres remaining installed, I caught and passed a few other riders. The fourth hybrid rider I passed sat in my slipstream until I glanced over my shoulder and just about needed a change of trousers when I realised he was there. Good company for the last few miles took my mind off the tarmac slog, as we chatted about the estate and its new owners, and the relative remoteness of the cottage he was riding back to. I bade him farewell at the Melgarve Bothy and continued the slog up and over Corrieyairack on my own. Although mostly rideable, a long week at work meant I was feeling pretty knackered before the start, and so I took the easy option of walking round a couple of the looser, steeper hairpin bends on the zig-zag section near the top. Ascending into the clouds, the Beauty-Denny tower lines were barely visible through the gloom, but I soon dropped out of the greyness again, to open views of the hills and forests on the north side of Loch Ness. Regardless of your views on development in these locations, you have to be impressed by the engineering that goes in to building overhead power lines at this height, in these remote locations. 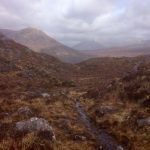 This entry was posted in Scottish National Trail on April 5, 2017 by admin. A work appointment in Dunoon this morning led to a 200mi round trip for a couple of hours of work, so the only sensible thing to do was take a half day and pack the FF29. Beinn Bhuidhe is the only munro in the “Arrochar Alps” area I have not yet climbed, but a look at the forecast convinced me that ticking off the summit today (on my own and in driving rain) would probably not be a sensible idea. Instead, I decided to stick to the main track built for a recently constructed hydro scheme, and get some much needed riding in the legs, scoping out the route for a ride next time I have a work commitment down this way. This looks like a munro where the top section will be a steep walk, but I planned to just ride up and down the track this time round (and didn’t even bother packing the walking boots). The track is pretty much as you would expect for hill tracks made for these kind of schemes – rough and steep. A couple of short pitches (about 70m of climbing at 450m) required walking, but the rest could be grunted up in a granny gear. Definitely not as rideable as the local climb up Ben Chonzie, but a lot quicker to get up (and down!) than walking the whole route in from the road. For going on to the summit, the usual walking path apparently crosses this track a bit before the point where I turned round, but I must have missed it when trying to keep my head down out of the rain. The track down over the side of Newton Hill is steeper, but works okay as a descent, and allows for a bit of variety on the return leg. 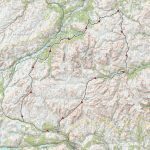 Given that the track is not yet plotted by Ordnance Survey, I have posted the GPX file for use when planning your own route. This was never supposed to be some sort of New Year resolution post, or a pat on the back for rides in 2016, but the reality is that I only ever manage to sit down and type these things in the Christmas holidays. I’ll not claim to be the most adventurous rider (exploits of VCMers around Europe and further afield are far more glamorous) so this is more a call to arms to the local adventurers. A show of solidarity to those who, like me, currently lack the time, the money or the “family passes” to get further afield for their riding. I’ve been lucky in having a new backyard since May, so having spent years getting to know the Pentlands like the back of my hand, I now have a vast new playground in Highland Perthshire. Every ride offers the opportunity for a new bit of trail, a new way to link things up, or a bit of “I wonder where that goes…”. Evenings are spent hunched over OS maps (or their digital equivalent). Weekends are spent riding my trusty Kinesis hardtail or CX bike (now a combined 10 years old) from the back door with a new horizon over every hill. Sure, you might get some weird looks in the office on a Monday morning (or from the hill runner who laughed in my face as I slid my CX bike down a section of muddy hillside that it was completely inappropriate for), but I’ve (almost) never come back from a ride in a worse mood than I left in, and there is beauty to be found in those hills. 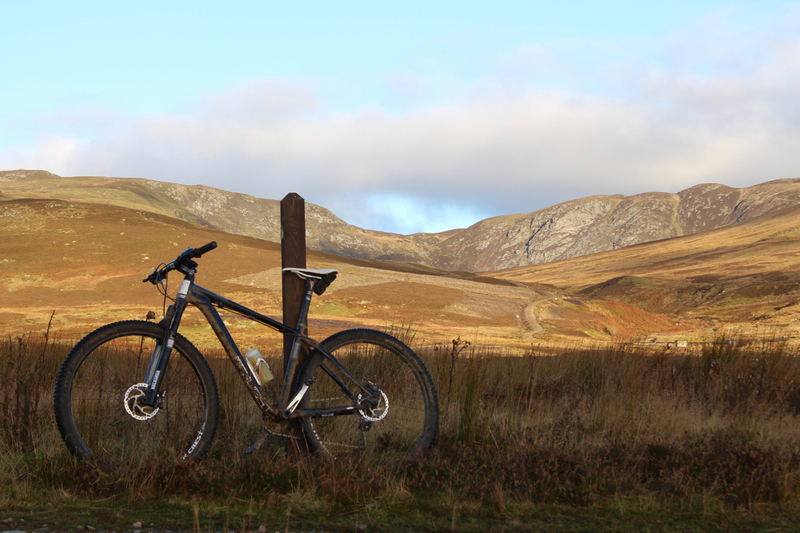 Today, despite the 0 degree temperatures and the northerly headwind, I shouldered my bike over a heathery hike-a-bike section to be greeted with one of those “this is why we ride” moments: a genuinely stunning view of the Lawers hills covered in snow set against a blue sky. 5 minutes later I was metres from the herd of deer that had generously formed the “path” I was riding. An hour later, rays of sun between sleety squalls were illuminating stripes of snow covered glen, made all the more striking by the contrast with the surrounding greyness. Even in the gloom of midwinter, there is natural beauty to be found. There is nothing that a few extra layers of Endura kit and a positive attitude can’t overcome. As the ever wise(?!) Chris Duncan often says after his usual Pitlochry based forest loops, outside is free folks. Get out there and ride. 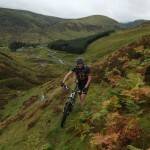 The next stage of riding the Scottish National Trail has been a long time in the coming. Two young boys, a new job, lots of commuting and a house move mean that free weekends have been difficult to come by. I’ve been looking forward to this stage for a while – a bit more remote, but logistically a lot easier than the next few sections. 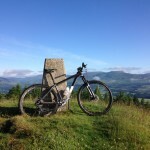 The first weekend in June 2016 could not have seen better conditions for riding (barely a drop of rain at home in Perthshire for the past four weeks), although being Scottish and needing something to complain about, the weather was, if anything, a little too warm. Joined by Simon again (who rode the Comrie to Pitlochry section with me), we parked in the spiritual home of Velo Club Moulin and picked up the trail in Pitlochry early on Sunday morning, with easy riding alongside Loch Faskally and the River Garry northwards to warm up the legs. A mix of forest tracks and the odd sandy singletrack in woods that looked like they might contain lots of fun options for lucky locals. Popping out onto a back road following the river from Killiecrankie to Blair Atholl allowed a few swift miles to be ticked off in the sunshine, before stopping for an early coffee and sublime carrot cake at The Watermill. This would normally be a bit early in a ride for a stop, but this would be the last chance before Kingussie – it would be barren glens from here on in. The ride up Glen Tilt was exactly as I remembered it. Like many Scottish mountain bikers, I have ridden down here as part of the classic Beinn a’Ghlo loop (around the East side of Beinn a’Ghlo to Fealer Lodge, and then a great descent to and then down Glen Tilt). The riding up the Glen was uninspiring but brisk – easy Land Rover tracks follow the river, giving a chance to glance at the interesting pools and rocks in the river, with tall hills on either side (mental note: looks like there are a couple of rideable munros up here). When the land rover track eventually peters out, the riding gets more entertaining, with singletrack punctuated by rock step ups and the odd burn crossing. Mostly rideable for those in the zone, but momentum is your friend here – satisfying to clean as many of these sections as you can. In this section, the route overlaps with the “Cairngorm Loop” – evidenced by the numerous bikepacking individuals we passed heading south. 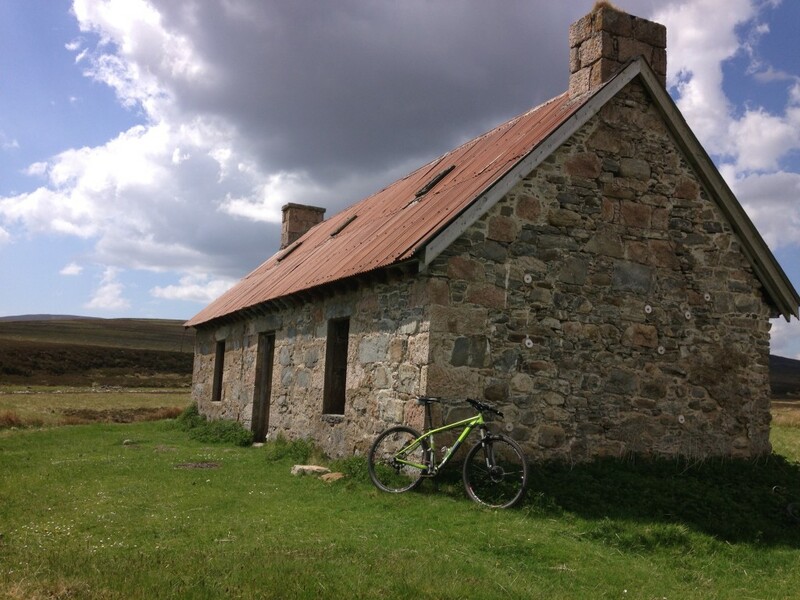 At the top of the Glen, passing the ruins of the Bynack Lodge gives a real sense of remoteness – by this point we have ridden for miles since the road, and when in use, the lodge would have been barely more accessible from the Braemar side either. Crossing the Geldie Burn (disappointing the waiting hoard of walkers who were anxiously waiting to see if we would fall in), the route turns Westwards climbing gently alongside the Burn. At Geldie Lodge (another ruined hunting lodge) the double track runs out and the climbing gently continues across boggier singletrack. After several dry weeks this was mercifully rideable, but this could have been a very different section in a wet Spring – several miles of burn crossing and bog could have been hard work. A scaffolding crossing over the impressive waterfalls on the River Eidart marks the start of the track heading downwards. At this point a blown fork seal added to the creaky bottom bracket (from the aforementioned river crossings) and the spongy front brake so a steady approach was taken, as the forks pogoed up and down. At the top of Glen Feshie we chatted to a rider heading to Braemar from Aviemore for a week of work by riding up the way we had come, and then on to the Linn of Dee. Not a bad approach to commuting. 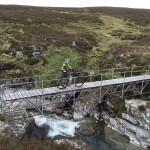 As we descended further down Glenfeshie, the trail becomes a mix of single and double track with numerous river crossings and a few freshly laid sections of new stone. The reason for the new sections soon became clear as we rode past numerous vast washed out gulleys – the power of the water here in previous winters has clearly been awesome, and it was interesting to see tiny burns running down vast scars in the hillside. Eventually crossing on to the west side of River Feshie at Charnachuin, we picked up what is now a well surfaced estate road to tick off a few easy miles in the sun. Eschewing the obvious turn westwards through the forest, the route continues on this for a few more miles, instead turning into the forest only closer to Inshriach, and winding down towards Insh before doubling back to Kingussie. From here, a gentle mix of forest track, footpaths and the odd tarmac section brought us into Kingussie for some very well earned steak pies in the sun. Another stage dispatched, and the satisfaction of tired legs for the drive home. More of this sort of thing please. 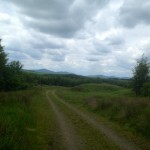 This entry was posted in Scottish National Trail on June 23, 2016 by admin. After last week’s failed attempt at combining “stages” 4 and 5 of my planned Scottish National Trail ride, I took advantage of the continued dry September weather to nip back to Comrie and finish the job off properly – 40 miles of mountain biking from Comrie to Pitlochry. As noted on the last post, the logistics of a ride from Comrie were a bit of a headache, but this was solved by joining forces with VCM teammate Simon Fairfull (most of the rest of the VCM crew were jogging or slogging around West Yorkshire for the Three Peaks CX race), and leaving a car at each end of the trail. After an 8.30 depart from Edinburgh, a car was abandoned in Pitlochry, and the fun twisty roads from Pitlochry to Comrie were quickly dispatched. The driving to the stage start meant we finally rolled out of the car park after 11am – setting off up the Deil’s Caldron climb I had ridden in the previous post, and on to Invergeldie where I had turned round little over a week ago. 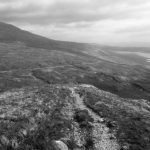 The track from here will be familiar to any munro baggers who have slogged up the grassy mound of Ben Chonzie – a good land rover track that quickly gains height for a couple of miles. We parted ways with the track before the slopes of Ben Chonzie kicked up too steeply, and turned north to head on up the valley. A good wide path narrowed to single track and eventually petered out for the last few hundred meters as we bogtrotted to the top of the bealach. From here, the map suggests continuing north for a kilometre or so, dropping into the valley, but with no obvious path, we cut the corner slightly to pick up a land rover track and drop down to the dam on the valley floor. Turning east, the path now follows around the back of Ben Chonzie. 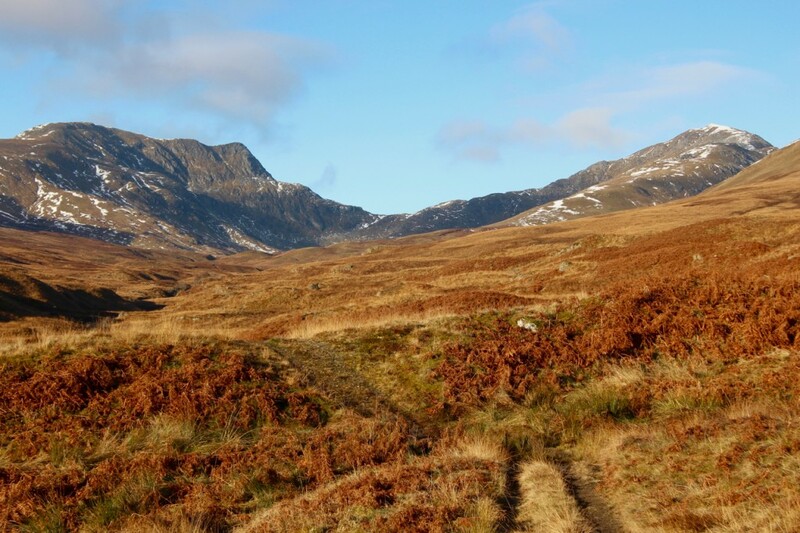 The route picks up the Rob Roy Way again, with flat land rover track miles down to the farm at Auchnafree. The track kicks up more steeply again here – a narrow single track climb above a burn with plenty of obstacles thrown in. Damp rocks and a worn Racing Ralph on the back led to more dabs than I would like – almost falling down the bank towards the burn in one moment of inattentiveness. The parts which were rideable were slow and technical, but satisfying. After picking our way over and around the boulders, a Land Rover track is picked up by the Lochan, which dropped us down to the minor road Loch Freuchie and then the parallel fast doubletrack, alongside the River Quaich. Turning our legs to “slog” we turned up the steep road climb out of the valley towards Kenmore. This afforded great views back down the valley and at least allowed the height to be gained quickly. The reward was fast miles eastwards towards Aberfeldy – initially on good land rover tracks, ducking beneath the huge (and controversial) pylons of the Beauly to Denny power line, and finally on to the footpath alongside the Birks of Aberfeldy – great single track with little rocky step downs on the bends. A coffee and some tablet refuelled us in Aberfeldy before a few easy miles of riding. Although pan flat, the path was generally tight and twisty – more entertaining than a path squeezed in between the River Tummel and the main road eastwards had any right to be. 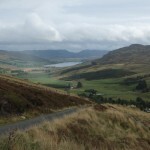 Reaching Grandtully, a helpful signpost marked the footpath to Pitlochry and suggested that only around 4 miles remain. Excellent. What that signpost didn’t say was that half of those miles would be steeply uphill. At this stage in the ride, Simon had a leg injury which was playing up – not ideal up a steep, often grassy climb. The trail was good though – single track that was satisfying to clean, with only a few ditches near the top to force a dismount. Over the top, we entered the woods and thankfully turned downhill again for a final fast blast into Pitlochry. Like the descent into Aberfeldy earlier, this was a fast entertaining blast through the trees, and was a great way to finish a good ride. A spirited drive on back roads to Comrie followed to pick up the other car. 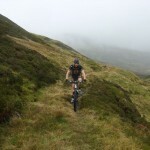 A good day out – another 40 miles of Scottish National Trail ticked off, and now well into Highland Perthshire. I am really looking forward to the next section from Pitlochry to Kingussie up Glen Tilt and down Glenfeshie, but that will probably wait until 2015. I need to earn a few more brownie points for these big days out first. The GPX for the ride can be found here. 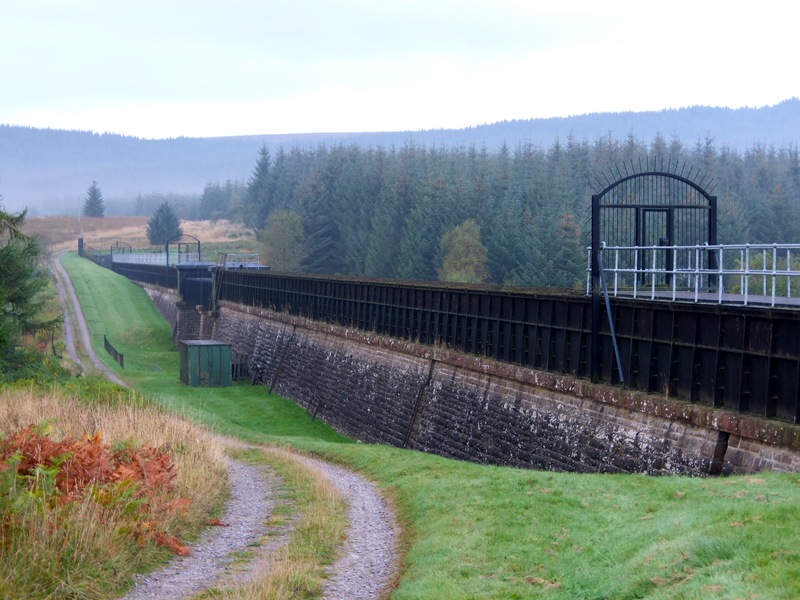 This entry was posted in Scottish National Trail on October 3, 2014 by admin. 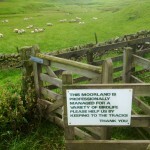 The next leg of my ride on the Scottish National Trail has been a long time coming. The last day on the trail was back in April of this year, but a dry September and a free weekend finally coincided to get a few more miles under the tyres. 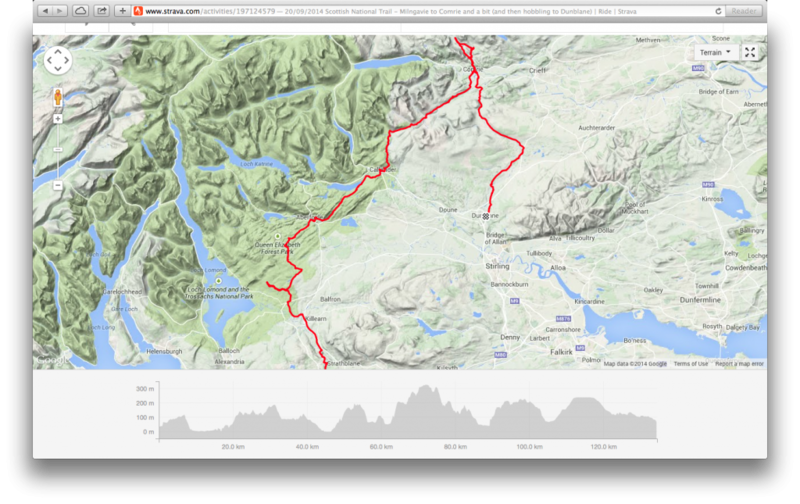 I plotted out the route some time ago with the next leg being Milngavie to Comrie, followed by a separate, slightly shorter day for Comrie to Pitlochry. With a lack of train lines in the Comrie area, the obvious solution is an overnight there, but a full calendar put pay to that plan, so I found myself on the 4.50am sleeper from Edinburgh to Westerton, and pedalling up to Milngavie for a 6am start with the intention of reaching Pitlochry in the evening. Combining the two sections would give a total length of around 90 miles. The initial riding from Milngavie northwards will be familiar to many Scottish mountain bikers – the easy, fast start section of the West Highland Way (interspersed with those bloody gates). My speed was kept in check by the pre-dawn light, but the miles were ticked off and Drymen approached. A lapse in concentration saw me continue on the West Highland Way for a couple of miles more than necessary until I realised that Conic Hill was alarming close, and re-traced my steps to pick up the Rob Roy Way. 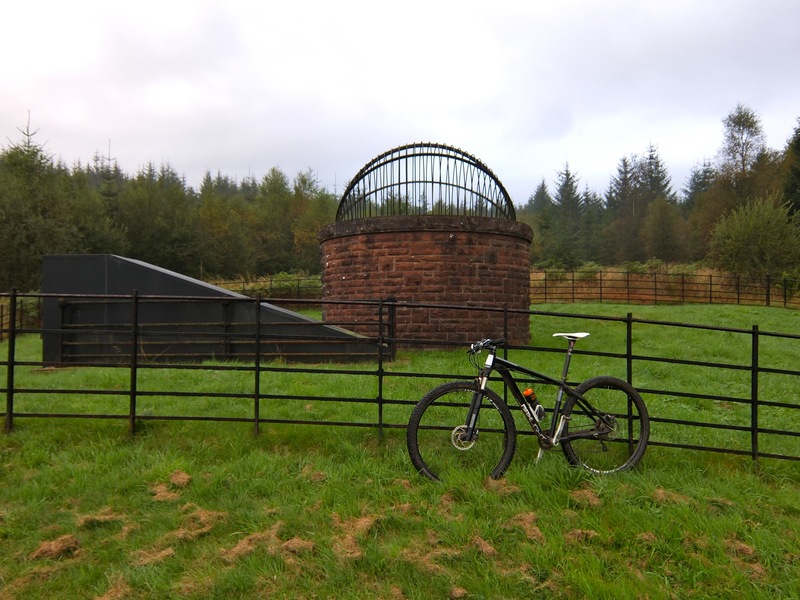 The riding here was similarly easy – fast forest fire tracks and roads into Aberfoyle, bypassing the Victorian industrial heritage of Glasgow’s water supply. The route from Aberfoyle started by Dounans Centre, bringing back memories of many a Scottish XC race (thankfully no need for 4 laps up Heart Attack Hill today). Today’s path climbed more gradually eastwards, petering out to single track interspersed with a series of rocky step ups that wouldn’t have been out of place in a manmade trail centre. Mostly rideable with fresh legs on a good dry day, this was a dry day, but I was already 25 miles in by this stage. Remounting was followed by an over the bars in an invisible hole in the grass, but it was good to be riding a good mountain bikers’ trail. 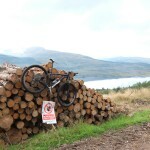 The singletrack spat me out on to familiar forest trails by Loch Venachar, and the run into Callendar was broken up by a short detour into the woodland trails at Coilhallan – not technical, but a welcome alternative to the obvious road link. After a first lunch in Callander (at 9.30am?!) I bumped into some friendly company in the form of another rider for a slog up by Bracklinn Falls and on to a good track towards the south side of Ben Vorlich. The bridge shown on the OS map by Arivurichardich has long since disappeared, and even after a dry September, it was tricky crossing without getting wet feet. It turned out to be tricky to cross without getting a wet backside too, as a cleat to green rock interface ended with the inevitable sit down in the river. At least it gave me a chance to check whether my rear light would work underwater. It turns out that CatEye lights can withstand a full dunking: it fared better than my bruised coccyx. The track eastwards was a well worn land rover track, giving two good single track grooves, livened up slightly by some overhanging bracken to catch out the unwary. 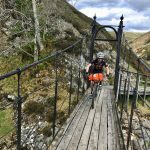 For the first time on the Scottish National Trail, the views felt almost Highland – empty glens accessible only to the determined, backdropped by impressive slopes that only proper Scottish mountains can provide. At this point I pressed on solo, as my fellow rider, John, headed off towards Ben Vorlich for some hike-a-bike. 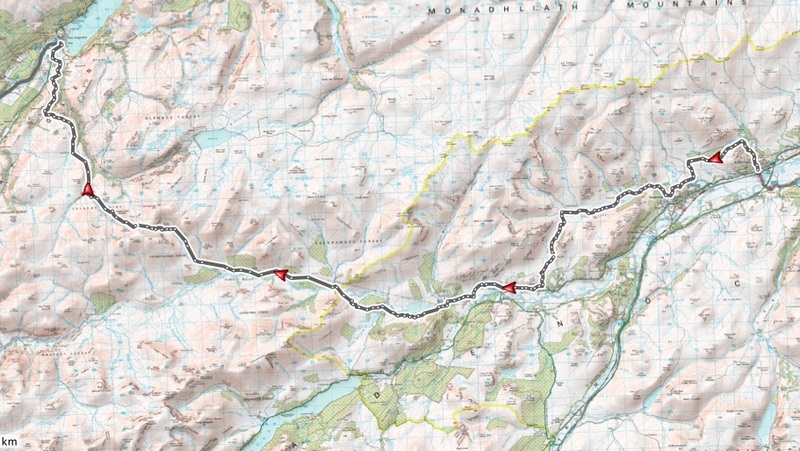 Continuing on towards the top of the road by Auchinner, the suggested route eschews the good access road in favour of the track on the north side of the river. Only the most generous cartographer could describe this as a track though – the reality was a rough line of flattened marshy grass, lightly trodden by sheep. Anyone riding this on anything other than the driest summer’s day might prefer the easier option of the access road towards Comrie. 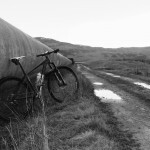 Eventually the track does improve after passing a couple of bothys though, and the run into Comrie was easy enough. By this time, I had been on the go for the best part of 6 hours, so a second lunch (at noon, so at least it was lunchtime this time) and a bit of recuperation in Comrie was in order. A calf niggle at the start of the ride 60 miles ago was making itself known. In hindsight, a tweaked muscle after a recent race had been ignored, and a new misaligned cleat was probably to blame. Despite adjusting that back in Callander, I wasn’t sure how much further I could push on for. I ordered a recovery coffee only to be told (in the friendliest way) that I looked a bit muddy. I lacked the energy for banter and the best I could manage was an apologetic explanation that I would be taking away rather than sitting in. At this point all I could think of was that this would be a great place to break the ride with an overnight in a hotel with the family, as had been the original plan. After a caffeine boost, the climb out of Comrie through the “Deil’s Caldron” offered a nice piece of trail through the wood below the single track road. Turning off to cross the River Lednock, a short link on the route plan turned out to be a push through waist high bracken, before rejoining a better track following the east side of the river. Arriving at the car park at Invergeldie, I knew I was faced with a 25 mile relatively remote section towards Aberfeldy. With a calf muscle that was now making its presence known on every pedal stroke, I sat in the sun for a few minutes and made the difficult decision to abandon, heading back down the road to Comrie and onwards over the 20 miles to the nearest train station at Dunblane. Game over. Doing an about turn at least allowed me to descend through the woods by the Deil’s Caldron again. Even that didn’t got quite to plan though, as I rounded an almost blind bend at speed to be confronted with a narrow bridge over a burn. Realising that I wasn’t going to make the bridge, and that falling off the side of it would result in certain death (well, possibly), I made the quick decision to hammer on the anchors and ditch the bike – face brake fully deployed. After picking myself up and dusting down the bike, I realised that there was a rideable line through the burn beside the bridge. Idiot. As I hobbled back on the road (freewheeling the downhills, riding one legged on the flats and standing up on the climbs to stretch that dodgy calf muscle out better) I knew I had made the right decision. It was frustrating to abandon a ride, knowing that my legs were otherwise fit enough to make the 90mi to Pitlochry, (that would still have been shorter than last year’s South Downs Way), but I was heartened by the thought that I would enjoy the next section soon as a shorter 40 mile day out with fresh legs. 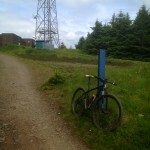 The planned GPX for Part 4 from Milngavie to Comrie can be found here. 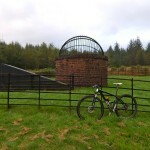 The GPX for the ride (including a few short wrong turns, a forestry diversion and the escape to Dunblane can be found here. 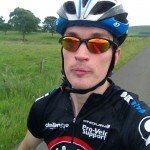 This entry was posted in Scottish National Trail, Uncategorized on September 23, 2014 by admin. 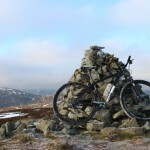 With limited time to ride at weekends, I have been thinking about making better use of my time when riding at places like Glentress, and cutting out the wasted hour or two in the car occasionally. The trip to Peebles from south Edinburgh takes little over an hour on the road bike, but there is no obvious route for a mountain biker. If riding to meet others, any route would need to be reasonably fun, short enough to be achievable (ideally both ways) and avoid too much road (which always feels like a bit of a slog on a mountain bike). 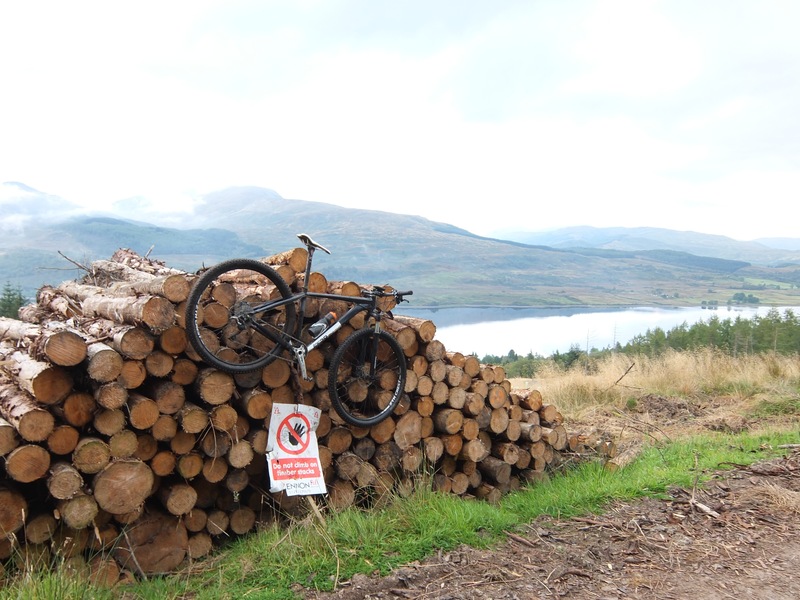 There is obviously the Scottish National Trail section used on a previous ride, but I felt that something slightly more direct must be possible. 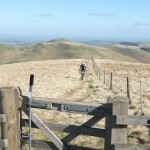 After a few nights poring over OS maps, a handful of candidates were drawn up (more on some of the others in future no doubt), and a favourite was selected – a fairly direct route, and also using a fair amount of what looked on the map to be good rideable trails. After months of busy weekends of racing and other plans, an ideal opportunity presented itself with my sister keen to be shown around Glentress. Originally I had planned to ride both ways (perhaps with a different route on one leg) to try out these routes, but this way allowed a slightly more sensible distance – driving to Glentress in the morning for a good first ride round the blue with my sister (and a walk for wife and son), the obligatory lunch in the cafe, and then a solo ride home. The proper planned route starts close to the top of the black climb, so it made sense to tweak the start slightly and ride right to the highest point of the black (at the mast at Dunslair Heights), before cutting left on to a fire track, and heading north. 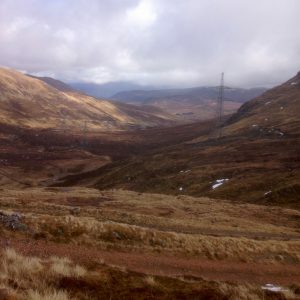 Those keen to cut a mile or two will find a track on the map from the bottom of the “Britney Spears” section of the Glentress Black loop, which cuts across to the adjacent fire track, and would save the final climb up to the mast. The turn off by the mast at Dunslair Heights, after climbing to the highest point on the black route. No entry past this point? On the wrong side of the line by some logging operations. Cheeky trails? Empty hillsides between Lamb Law and Bowbeat Hill. I was thankful not to have to ride up some of those ridiculously steep logging tracks though. 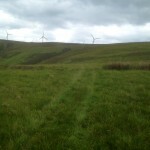 The faintest of trails leading between the windfarm and the valley floor. The track fades away completely higher up, and could be a slog when riding up, rather than down. After a brisk, warm climb up the black route, the fire road descent allowed the legs a bit of recovery, but the drop in height is a bit disappointing – I have envisaged a flattish traverse across to the wind farm rather than wasting that well earned height. The route is relatively obvious, being the main fire track for most of the way, although being a Forestry Commission forest, it is worth having some navigation aid since there are always a few generic looking junctions to confuse matters, and the trees do a fine job of masking any navigational landmarks. After feeling liking dropping most of the height gained on the Black route (in fact only about 300m is lost), the route kicks up again past a barren felled hillside, and on to Bowbeat Hill. The wind farm at the top of the hill is a welcome distraction from the climb, and the track through to the northmost turbine is easy riding. Here, the track abruptly ends, and I was left to partly ride and partly walk across a heathery section, through a gate and follow my nose towards the edge of the valley I knew contained a good track out. After a couple of minutes following what could only be described as sheep tracks if you were feeling particularly generous, I picked up a slightly better grassy track which took me down to the valley floor and on to the gravel double track. Ridden in reverse, I suspect that there would be 5 minutes of walking for anybody slogging up a steep hillside on a faint track through the heather. Flat, fast gravelly tracks through Toxside Moss, which is littered with small quarries and old debris. Only some flat miles and that range of hills in the background to tackle to get to Edinburgh. The top of the last descent when heading northwards – only the descent into Bonaly to go. A fast blast to Gladhouse Reservoir made up for any time spent wading through heather (although look out for the axle-deep puddles in a couple of places on the main track). There is no obvious way of completely avoiding the roads here, but the quiet roads round Gladhouse are pleasant enough, and there are a couple of fire track options through Toxside Moss too. Back roads are the obvious way from here to Mount Lothian and on towards Penicuik (although it remains to be seen if this road will remain when the mine at Cauldhall expands soon). Riding through Penicuik did have me wondering if there are probably better options for avoiding a bit more of the road, but these are easy miles, and the total percentage on the road still isn’t huge. From here, I chose to ride alongside Glencorse and over the Pentlands using The Phantom’s Cleugh (allowing me to drop down to Bonaly without any serious climbing), but the tarmac miles by Glencorse could probably be avoided. Unfortunately the obvious alternative is the grind up the Castlelaw climb, and I’m not sure that the legs could stand for that on a long, warm ride. Generally a good and achievable route. Only a few minutes through the heather at the end of the wind farm is tricky to ride, and the road sections through Penicuik can definitely be reduced. There is a reasonable amount of bland forestry commission fire track, but at least those miles are quickly ticked off. I probably need to ride this in reverse to see how rideable the final pull up to the wind farm is, but this is definitely a candidate for a good way to leave the car at home. Water bottles I should have used: about 4! Bunnet to: @Stellite who ran the track up towards the wind farm after discussing this earlier in the year. After months of procrastinating, a sunny April finally allowed a chance to ride the first leg of The Scottish National Trail from Kirk Yetholm (close to the English Border) to Peebles. After riding the second and third legs solo last year, I was joined by XC whippet Dougie Shearer for this part. Having left a car in Peebles at 8am, driving across the gentle rolling hills around Kelso didn’t quite prepare us for the slog which lay at the start of the ride. Although the “official” start of the trail is in the village square in Kirk Yetholm, it seemed rude to come this far south and not actually visit the border, so we set out southwards from Kirk Yetholm, up and down the minor road, up a grassy mound and on to a ridge along the Pennine Way. The border at this point is an inauspicious fence and stone wall which provided a handy spot for leaning a bike for the obligatory border photo, but little in the way of grandeur. For all Cameron McNeish’s talk about discovering Scotland through his National Trail walk ahead of the referendum in September, the English side of the wall looked much like the Scottish side – rolling hills and scattered sheep as far as the eye could see. From here, a cloudless blue sky covered the whole of the eastern Scottish Borders in front of us, and it was easy to pick out where the route would head next. First though, we continued briefly southwards, climbing the ridge alongside the border and passing White Law and beneath the 549m summit of Black Hag, before performing an abrupt U-turn and finally being rewarded for the grassy slog with a fast single track and double track descent back towards the valley floor and on towards Kirk Yetholm. Rejoining the trail northwards at our start point in the village square, the national trail at this point follows the waymarked “St Cuthberts Way” across fields, alongside rivers and joins the dots of the few notable mounds in the area – Crookedshaws Hill and Wideopen Hill. After the efforts of the initial start loop climb and these grassy mounds, I was starting to wonder about the 1×10 with 34t chainring I was running on the XC bike. Just managing to stay on top of the gear, I managed to spin and gurn upwards (thankful for bone dry grass at least) and on down to flatter sections through Morebattle and along minor roads past Cessford Castle. Although expecting the arrow straight Roman Road of Dere Street shown on the map to be a straight boring slog, in fact it turned out to be a lumpy single track trail through grassland and woods. 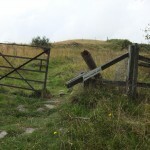 I suspect the Romans didn’t have to put up with a relentless barrage of stiles and gates though. Or perhaps that’s why they didn’t venture too far north in Scotland. Almost as frustrating was a section alongside the River Tweed which I expected from the map to be flat and smooth, but which often involved a series of wooden stairs – sometimes inviting stair rides, but often time sapping walks. Continuing with the Borders tradition of ransacking and pillaging by marauding visitors from the south, a shortcut along the road allowed us to empty the local Co-op in St Boswells before turning towards Melrose. The route again makes a bee-line for the only notable hills in the area – the steep twin mounds of the Eildon Hills which I knew well from childhood walks. Thankfully the route passed relatively painlessly through the middle before descending in to Melrose and resuming the march along the Tweed and picking up the NCN cycle route. 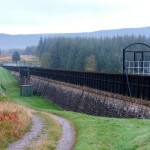 The easy miles of the old railway line were cut abruptly short as the new Borders railway line re-emerged on to the old route, necessitating a slight detour on to the main road before traversing the side of Gala Hill. By now the long climbs were taking their toll – my legs were still working, but only at a slower pace and Dougie had been off colour but ploughing on all day. After debating the merits of lassoing a few lambs to tow us up the hill, we instead settled for haribo and strawberry laces as a better source of fuel. Passing by the summit of Hog Hill, it slowly dawned on us that although the Three Brethern looked teasingly close, the Selkirk road still lay in the way, and sure enough, our hard won height was again lost as we dived down to the road and immediately back up into the Yair Hill Forest. 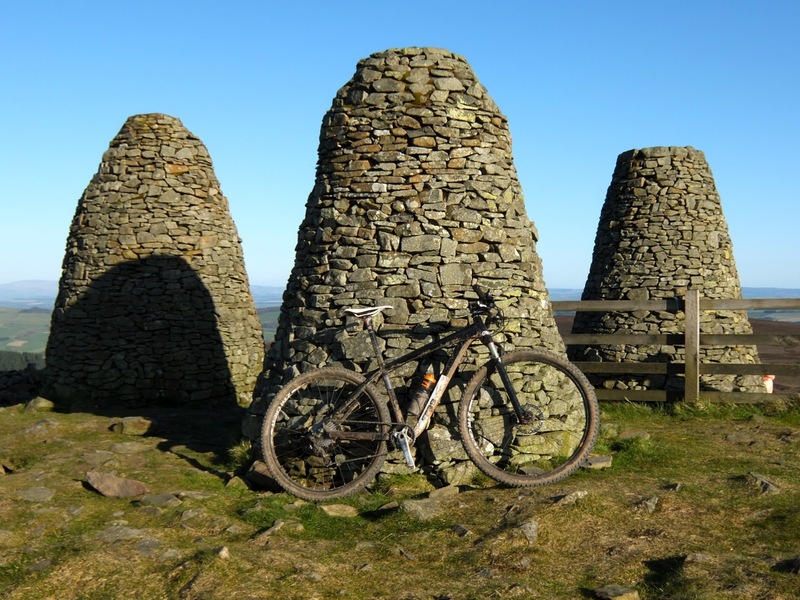 The impressive stone cairns of the Three Brethern will be a welcome sight to anyone who has ever raced the Selkirk MTB Marathon. 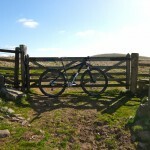 Thankfully the late afternoon weather was a little more welcoming than some previous trips where we had struggled to stand upright here, so final fuel was taken on board before the fast ride along the ridge on familiar trails on to Minch Moor. Eschewing the tempting swoopy trails of Innerleithen, we bee-lined down the Southern Upland Way path, startling some poor chap relieving himself against a wall as we zipped by at 30mph. By this time I was already pushing my luck for time, so we time trialled along the road past Traquair and into Peebles, skipping McNeish’s short detour into the adjacent woods, and arriving back at the car almost 10 hours after setting off from Kirk Yetholm. Although the long grassy climbs, relentless gates and Dougie’s illness had added to the time (we had both expected 7 hours to be sufficient), there was a good sense of smug satisfaction after ticking off almost 70 miles of off road riding on dusty trails. Again, the route had been mostly rideable (with a bit of gurning required for some of the steeper climbs, and a bit of walking required for a few riverside steps) but it would certainly have been a bit more of a muddy slide in wetter weather. Personally, I have now ticked off a total of around 150 miles from Kirk Yetholm to Milngavie, and once I have re-earned the brownie points required to make up for being 3 hours late home from this part, I’m looking forward to a two day stint from Milngavie to Pitlochry next. As the route heads further north, this first stage has reminded me that (i) a lower gearing might be sensible, (ii) I always get sunburnt on the first big sunny day out of the year, and (iii) I need to pack more Haribo. Hopefully a few words on Parts 4 and 5 might follow later in the year. Finally, a tip of the hat to Dougie for still having the presence of mind after 10 hours in the saddle to stand on the brakes and avoid the wild boar that wandered in front of the car on the return to Kirk Yetholm in the evening. That certainly woke me up, not least with thoughts of wild boar burgers. Mmm…. 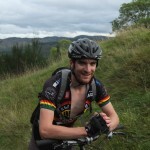 The GPX for my “Part 1” (which uses a couple of km of road shortcut at St Boswells and past Cardrona) can be found here. 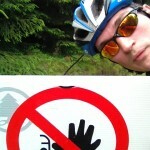 This entry was posted in Scottish National Trail, Uncategorized on April 22, 2014 by admin.